The philosophy of Postmodernism and its outgrowth called the Regressive Left have been an absolute disaster for the modern political left. The ideas of Postmodernism and the Regressive Left are false, fraudulent, irrational and are contributing to the political defeat of the left in nation after nation, and, even worse than this, are a threat to Western civilisation itself. Postmodernism and the Regressive Left have to be utterly defeated and smashed as the pre-condition for any new and sane left-wing political movement. That being so, I have collected my posts debunking Postmodernism and the Regressive Left in the links below, with a critical bibliography against Postmodernism as well. 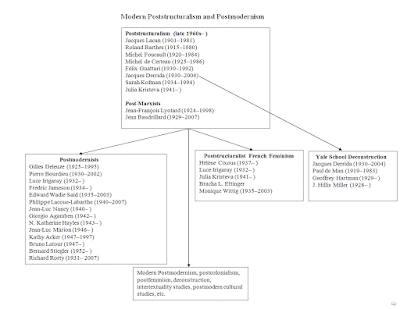 (3) Bibliography of Critiques of Postmodernism. Postmodernism is an outgrowth of French Poststructuralism, an intellectual movement in France from the late 1960s and 1970s. This was a reaction against French Marxist Structuralism. The early and big-name Poststructuralists actually began as Marxist Structuralists, such as Jacques Lacan (1901–1981), Roland Barthes (1915–1980), and Michel Foucault (1920–1984). If there was a seminal moment in the origin of the Poststructuralist movement, some people date it to a 1966 conference at Johns Hopkins University in which the French intellectuals Derrida, Barthes, and Lacan came to America and announced that they had turned against Structuralism. Derrida gave a lecture at this conference later published as “Structure, Sign and Play in the Human Sciences” (Derrida 1978 ) which marked his break with Structuralism and the general turn towards Poststructuralism. Roland Barthes’ later essay “The Death of the Author” (Barthes 1967) was another influential text of the early movement. In “The Death of the Author” Barthes essentially proclaimed that critics should divorce their study of a text from its author, and that a text is not a product of its author with a definite and fixed meaning intended by the author. When their revolution of 1968 failed and they became disillusioned with Marxism, the French radical left turned to Poststructuralism, this new type of philosophical and cultural radicalism. From France, Poststructuralism spread to the Anglophone world, and developed into the left-wing academic movement called Postmodernism. (4) the view that no text can have a fixed meaning intended by its author. (2) the one associated with the work of Michel Foucault (1926–1984). Jacques Derrida took Barthes’ “The Death of the Author” fantasies to even greater heights of mind-numbing insanity. Derrida invented the French word “différance” (a word that conveys the ideas of “difference” and “deferral”) to convey the idea that no word can even have a clear, definitive meaning at all: true and fixed meaning is supposed to be “deferred,” indeterminate, and unattainable (even though empirical evidence suggests that most of our language has a clear and fixed meaning, which we grasp well every day of our lives). Derrida’s famous method of Deconstruction is just the culmination of Barthes’ “The Death of the Author” idea. Since no text can have any fixed meaning, we can invent any meaning we like, and “deconstruct” any text by inventing a meaning contrary to what the text says. We can engage in utterly illogical, unfounded and fantastical attempts to show how any sentence actually implies or means the opposite, or nothing at all. The end result of all this is the view that no real external reality structures, fixes or even circumscribes our words and language, and that no objective truth, knowledge or reality exists. The second major strand of Postmodernism is the thought of Michel Foucault (15 October 1926–25 June 1984). Foucault was a French philosopher and a major member of the original French Poststructuralist movement. The Postmodernist strand associated with Michel Foucault essentially boils down to the idea that “truth” is whatever those in power determine it to be, and reality a construct of power, so every instance of power is oppression. I regard Foucault’s work and Postmodernism in general as deeply flawed and a terrible blight on the intellectual life of the left. The central element of Postmodernism is the rejection of objective empirical truth – a self-defeating and absurd idea that lies at the heart of all irrationalism. In our time, the rotten ideas of Postmodernism have morphed into the Regressive Left. However, Regressive Leftism is a natural outgrowth of Postmodernism, a point which many people fail to understand. (7) incredible abuse of the word “racism,” and applying it to trivial things that are not inherently racist, such as wearing sombreros or “culturally insensitive” Halloween costumes. (8) following from (7), identifying culture with race, and militant hostility to people who criticise immoral or illiberal religious or cultural ideas of non-white people, and above all in apologetics for Islamic fundamentalism and Islamism. (9) support for open borders or huge levels of mass immigration into the Western world. (10) the ideas of Third Wave Feminism. As I have pointed out before, the conventional definition of the “Regressive Left” is mainly confined to (7) and (8), but the fact is that “Regressive Leftists” often also subscribe to (1), (2), (3), (4), (5), (6), (9) and (10) or a selective combination thereof. Although Noam Chomsky has certainly influenced the Regressive Left as in (5), it is important to note that he rejects many aspects of their thinking, as shown here. If the left is going to develop any rational, intellectually honest and effective political program for the 21st century, both Postmodernism and Regressive Leftism need to be utterly rejected and defeated. “A Postmodernist Critique of Science,” February 10, 2015. “Alan Musgrave on the Success of Sciences as an Argument for Realism,” February 20, 2015. “John Searle on Realism,” March 7, 2015. “The Poststructuralists as Frustrated Marxists-Communists,” October 20, 2015. “The Consequences of Postmodernist Truth Relativism,” October 25, 2015. “Self-Refuting Nonsense,” November 1, 2015. “All Cultures and Cultural Ideas are not Equal,” November 21, 2015. “Keith Windschuttle on the Postmodernist Perversion of History,” November 22, 2015. “Chomsky on Dead White Male Science,” November 28, 2015. “How Not to Criticise Noam Chomsky,” December 14, 2015. “Rushdie on Extreme Multiculturalism,” December 17, 2015. “When the Word ‘Racist’ Loses all Meaning,” December 23, 2015. “Some Critiques of Edward Said’s Orientalism,” January 4, 2016. “‘Cultural Appropriation’: The Latest Nonsense from the Regressive Left,” January 9, 2016. “Extreme Multiculturalism versus Liberal Nationalism,” January 14, 2016. “The Regressive Left’s Obsession with Race,” January 17, 2016. “Peter Hitchens on Marxism and Open Borders,” January 17, 2016. “Nonsense about Science,” January 20, 2016. “The Gender Wage Gap is a Myth,” January 24, 2016. “Chomsky on Freedom of Speech,” January 23, 2016. “Chomsky versus the Regressive Left,” March 11, 2016. “What is the Regressive Left?,” April 22, 2016. “The Paradox of Feminism,” June 6, 2016. “Hating Whitey,” June 10, 2016. “Chomsky versus Feminism,” June 11, 2016. “Chomsky: Many Postmodernist Ideas ‘Pure Nonsense,’” August 14, 2016. “Truth Relativism is a Disease of the Mind,” August 18, 2016. “Anarchopac on the Old Left,” September 2, 2016. “Some Reading on What went Wrong with the Modern Left (Updated),” August 29, 2016. “The Myth of the Andalusian Paradise,” September 5, 2016. “Behold Third Wave Feminism,” September 8, 2016. “The Cult of Extreme Gender Equality,” September 13, 2016. “Monogamous Marriage is the Basis of Gender Equality,” September 16, 2016. “Women in their 20s Now Out-Earn Men,” September 20, 2016. “Christopher Hitchens versus a Feminist,” October 3, 2016. “The Utter Bankruptcy of Foucault’s Denial of Objective Truth as determined by Reality,” March 5, 2015. Bawer, Bruce. 2012. The Victims’ Revolution: The Rise of Identity Studies and the Closing of the Liberal Mind. Broadside Books, New York. Johnson, Gregory R. 1992. “Without Sense or Reference. J.G. Merquior’s From Prague to Park: A Critique of Structuralist and Post-Structuralist Thought,” Reason Papers 17: 153–160. Scruton, Roger. 2015. Fools, Frauds and Firebrands: Thinkers of the New Left. Bloomsbury, London. Derrida, Jacques. 1978 . “Structure, Sign and Play in the Human Sciences,” in Writing and Difference (trans. Alan Bass). University of Chicago Press, Chicago. 278–294. I think there's a possible viable Left position out there somewhere in logical space, but I think you guys are going to have to retrace your steps back to classical liberalism, and explore from there a different path than the "grab central power" idea, to get there. IOW, you need a form of Leftism that's wary of the State, and isn't so foolish as to think capturing the State is the solution to all the world's problems. I would suggest that what you really want to go for is a sort of PARALLEL SYSTEM OF COLLECTIVE SELF-HELP. i.e., rather than "insurance" against the "bad weather" of capitalism (buggy whips going out of fashion, etc.) being bought from within the capitalist system itself, let it be a function of collective solidarity amongst those who have no natural buffer of wealth or family. Anarcho-capitalists often point to mediaeval Iceland as an example of a society that functioned pretty well (for its time and technology) in an a-c sense. Well, yeah, but they forget that it also had a parallel system of collective self-help. IOW, the side of the Left that's about raising "class consciousness" was always right, in a sense, but it was never true that that was the basis of any sort of holistic alternative to a liberal social order. Liberalism and the minimal state are the final form of society, because the overall effect of it is general prosperity and progress; but since there is never an actually even playing field that people start from, and since there are always losers in every economic shift, there's always room for systems to compensate for poor starting positions, and loss in status from such economic shifts - and because of the knowledge problem (people know best what's closest to them) the best systems are always going to be ground-up. That, I suggest, would be consistent with the emotional appeal of socialism (solidarity with those on the lower rungs of the social ladder), while avoiding the trap of being inconsistent with liberalism generally (i.e. its pursuit of a particular kind of outcome wouldn't go against the more socially fundamental procedural equality - i.e. justice in the real sense - of liberalism). And if I'm not mistaken, that was actually a big part of the function of "unions" originally, till they were hijacked by Marxists as the "vanguard" of their silly "revolution". It was the road not taken because the Left was corrupted by quasi-religious ideology. It could be the new road, and the thing is I don't think you'd get much objection from most people to it, and any objection that did come from so reasonable an idea would reveal enemies of it as obvious fools.